UPDATED: Planet Xbox 360 just pointed us to their screenshot, and it's convincing. (Above). 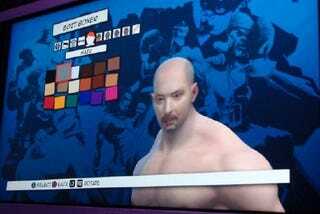 While previewing Face Breaker at the EA booth it was mentioned that Peter Moore's face had been scanned and entered into the game using the boxer editor. The face, which is creepily accurate, can be attached to any of the bodies and manipulated. Peter asserts that he suits a more chiseled look but the demonstration featured him as a blue monkey. From talking with them more about the addition to the game it seems that his face will be included in the retail build of the game and will more than likely be an unlockable character. That's a pretty shrewd move. Not sure how many sales it will do on that feature alone, but I'll put it in my GameFly queue. Here's what the rest of the game will look like, btw.